I am finding the research I am doing on Native Americans just simply interesting. Often their date of birth is not widely known but they always seem to have a date of death. Women were usually equal to the men, so men were not their masters or above them but worked beside them. They are so brave and different than people of European Descent where often times the woman’s adversary was man, for a Native American Woman their adversary is often disease, human, or of different origin altogether. They are not brave, or wonderful, intelligent, or interesting because they are a woman in a man’s world but because they are all of those things alone. I could find a man in Native cultures just as neat to research as a woman and trust that I intend to. Buffalo Calf Road Woman’s story is certainly no exception to this. She was a brave, very young woman who was also a warrior, possibly more brave than many of the men. I have read about two significant accounts where her bravery help win battles, although in a war that could never be won. She was born sometime in the 1850’s and her tragic death would be sometime between 20 to 28 years later. Buffalo Calf Road Woman or Brave Woman was a Northern Cheyenne woman who was born in a very tumultuous time for her people. There isn’t too much on her actually life, I would definitely like to do further reading but I do know she was sister of Chief Comes-In-Sight and wife to Black Coyote (not to be confused with the Sioux Black Coyote, they are not one in the same) both warriors. I have found nothing on her early life, and only one picture. But what little I do know has definitely made a lasting impression. During the Battle of the Rosebud on June 17th 1876 known to the Cheyenne as The Fight Where the Girl Saved Her Brother. While retreating, Chief Comes-In-Sight horse was shot and went down. He was surrounded by opposing gunfire and Indian scouts. Out of nowhere a lone horsewoman rides past and Comes-In-Sight jumps onto the back of her horse escaping gunfire. Her actions caused the Cheyenne to rally and the defeated George Crook and his forces. The same year on June 25th and the 26th was the large, more well known Battle of the Little Bighorn, also known as Custer’s Last Stand. Those who are not familiar with Custer and his tactics, he was not a very nice man. He had no issue murdering innocent people that got into his way. This being said, it was war. What can you expect of anything as nasty as war? The Cheyenne were silent for over 100 years about who was responsible for General Custer’s death, but it would seem that Buffalo Calf Road Woman had a large part in it. The Cheyenne women warriors believed him to be full of “bad medicine” and devised to take their own revenge on him. 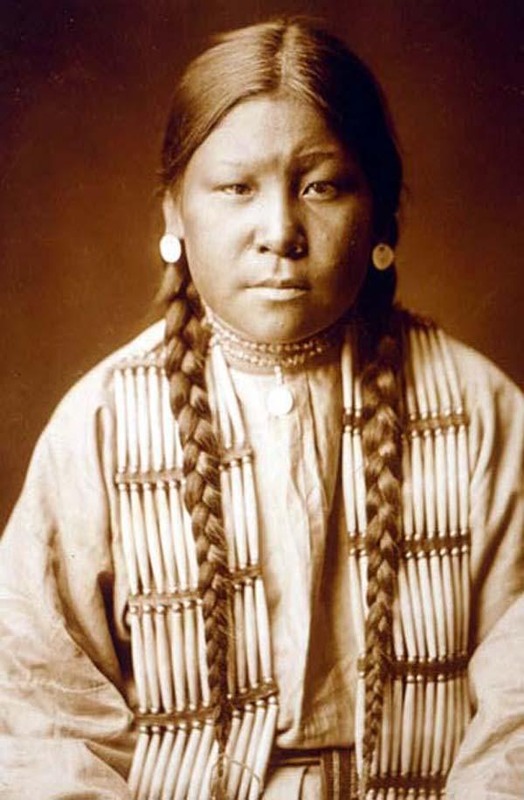 Although it is believed that either White Cow Bull shot him in the chest and/or Custer killed himself to avoid capture it was Buffalo Calf Road Woman who knocked him off his horse, making him an easy target. The Cheyenne surrendered in 1877 and took home on a much smaller reservation. The reservation was not habitable and they ended up fighting off disease and starvation. In 1884 they would be given land in Montana but it would be too late for many including Buffalo Calf Road Woman who died of either Malaria or Diphtheria in 1878 and her husband followed her into the next life by taking his own life shortly after hearing of her death. This entry was posted in Women Wednesday and tagged Battle of Little Bighorn, Buffalo Calf Road Woman, Cheyenne people, Custer, George Armstrong Custer, George Crook, Native American, Native Americans, Native Americans in the United States, women, women warriors, Women Wednesday. Bookmark the permalink. This image, taken by Edward Curtis around 1900-1910, is not Buffalo Calf Road Woman. As you noted above, she died in 1878 of diphtheria. This young woman would not even have been born yet when BCRW died.